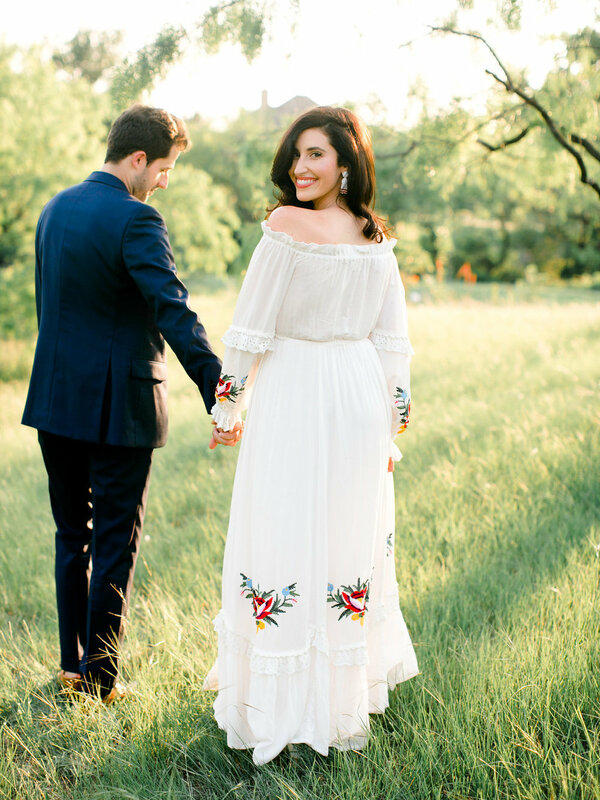 We were moved by the charm of the Paley family’s Texas homestead set amongst a sprawling landscape. The lovely combination of softly swaying grasses, native materials, and the golden hour glow evokes a nostalgia for a life lived more slowly. We wanted to capture the romantic ambiance of an intimate elopement surrounded by familial history. Inspired by the big sky sunsets in Texas and the natural materials found throughout the home, we chose a palette of textured neutrals layered with pops of color reminiscent of the vibrant hues found in the bride’s gown. Elements of warm wood, leather, and woven textiles provided a stunning back drop to celebrate the colorful elements. In a small intimate ceremony in the soft breeze of the homestead, Lauren and Dan said their vows with their closest family and friends.